I am so excited to have been putting our bedroom together in this house. I’ve kind of always let this room go, as nothing was really clicking for how I wanted it. I now know what I want and the pieces are just coming together. When it’s all done I’ll share everything, but for now I’ll begin with a simple little diy. 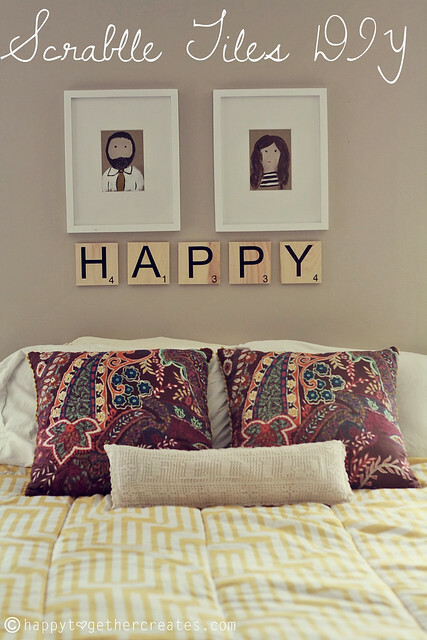 I teamed up with Laura of Say It On The Wall again to create these scrabble tile wall decor. I’m really “happy” with how it turned out. 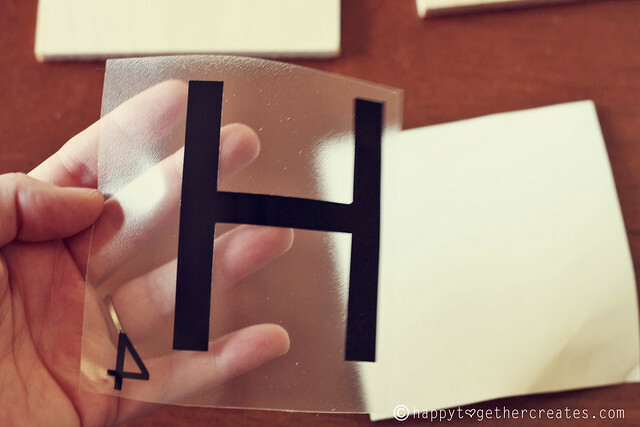 You simply peel off the back paper, making sure the letter/number stays in place. Then place it on the wood square and smooth it down real good (this is where the lovely “colored in crayon by my daughter” dough cutter came in handy ;). 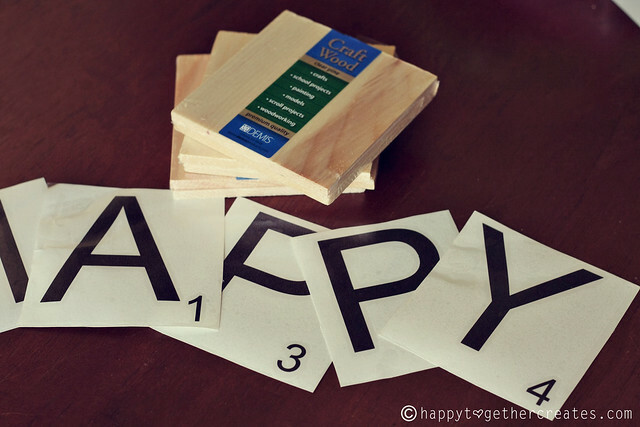 Try to place each letter at the same place on the wood squares so they don’t look off. 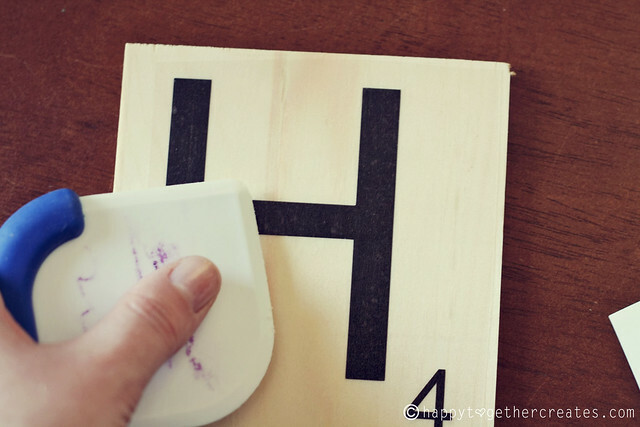 Then use the sand paper to sand around the edges. I stuck these on the wall using adhesive wall strips. Love it…what a great idea! awww these make me so happy!!! so cute! I love the sweet simplicity. Where, oh, where did you acquire the darling portraits? Or at least the frames? I’ve been deliberating about what to with the area above our bed (as my gallery wall was a fail, or at least, a disappointment). This You & Me art from http://www.houseofhepworths.com/2012/03/29/you-me-custom-artwork-tutorial/ was in the running, but I really, really like your pictures with the scrabble tiles. Hmm, so many possibilities. Well, they look great! When I first saw them, I thought, “Hmm, maybe I could paint something similar.” Although I wasn’t sure I’d like the finished product as much as I like yours. However, I think I’ve talked myself into it. Thanks for the encouragement! 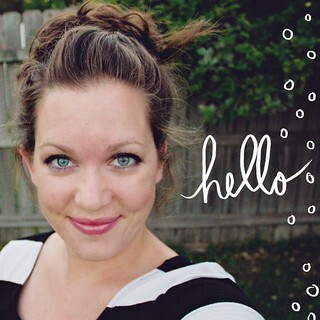 just found your blog, what a fun idea!!! Love your pillows,they have such great colors. where did you find them? I had bought them from an Anthropologie store about 2.5 years ago. It was a really great deal and I knew I would find a place for them eventually 🙂 It all came together when I spotted the comforter at Target. I knew the pillows would go with it and I’m so happy they did. So, so cute! I love Scrabble. 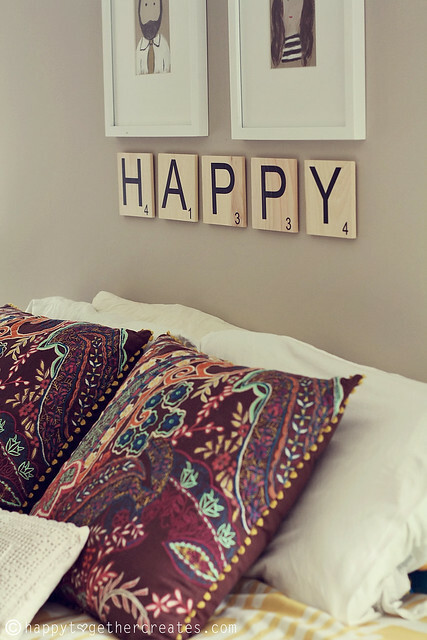 Can’t wait to do some lettering-type DIY projects when we move into our new house and I can really decorate again! Love this!! I’ve only been able to find 4.5″ craft wood squares online (from the same company as the one you recommended). Was it definitely 5″ you purchased? 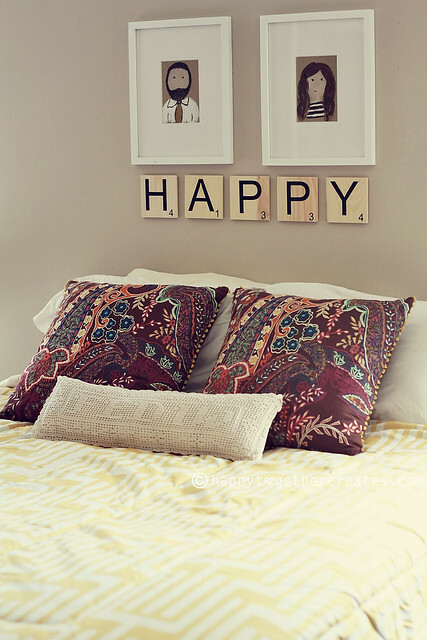 I’d like to do this but obviously want to make sure the vinyl letters fit before buying it all. You are right! Good catch! I just went and measured them and they are 4.5″. I just changed it in the instructions. Sorry about that 🙂 Happy crafting!